ADSL modem + Linksys cable connections. Also intermittent connection? I have 2 main issues. Do I need to fix anything? Second, I'm having intermittent connection issues for both wired and wireless connections. After some 15-20 minutes the connection drops. Restarting the modem or the connection resolves it. Browse other questions tagged networking wrt54g adsl2+ or ask your own question. Is it possible to access the modem/router setup page without forcing IP address settings? Can I connect two computers on an ADSL modem which has one USB port and one Ethernet port? 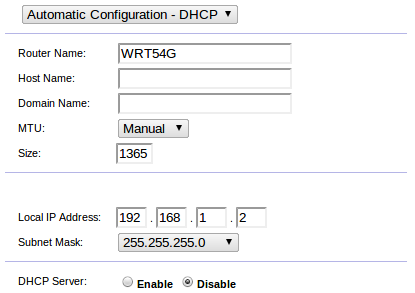 (open-wrt) Accessing clients from another connected router?